I keep seeing this picture around the Internet with a supposedly fascinating headline. I simply see it as a man who's values are misplaced. 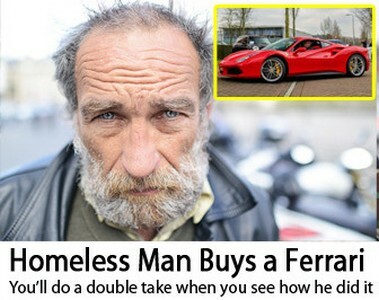 Why would someone without a home buy a supercar? A poor decision! Any rational thinking would place many things above this sort of choice. It was probably this kind of confused thinking that got him homeless in the first place. I haven't visited the site because its just too ridiculous to interest me. He looks unhappy as well. Does he now realise his folly?